2 - Additional rear backup plates required if the door bars are installed with an Ace, Deuce or Hard Bar. Purchased seperately. Jack up the rear of the car and support with surdy jack stands, be careful. Remove the rear wheels and the inner fender panels from the wheel well by removing the 4 screws if you have a first generation Miata or the 4 plastic fasteners if your car is a 1999 - 2005 model. Move the seats all the way forward. Remove the quarter trim behind the seats and roll back the carpet to expose the 3 bolts that attach the lower roll bar foot plates. Also pull back the carpet and insulation at the front of the door opening to expose the floor pan. Remove the 3 roll bar mounting bolts and insert the door bar as seen in Photo 1. From the wheel opening make sure the back-up plate is still in place, insert the bolts and snug but do not tighten the bolts. The forward foot plates should be as far outboard as possible and still clear the door panel. 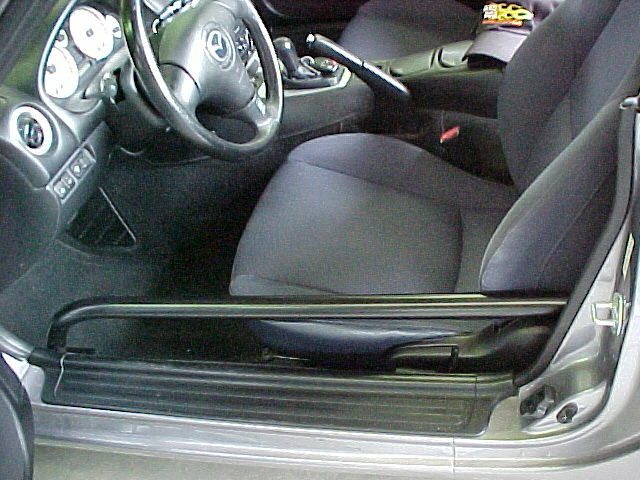 Check the clearance between the door bar and door panel by closing the door. Once you have checked the door panel clearance, drill through the front plate using a 3/8" drill, install the bolts w/ washers from the top and the back-up plates w/ self locking nuts from underneath. Torque all of the bolts to 45 - 50 ft/lbs (front & rear). Trim the carpet, reintstall the quarter trim panels and you are ready to go. The installation is the same as with the other roll bars except you do not have the lower mounting plates on your bar or the backup plates that go along with them. Measure down 5" from the edge of the bulkhead just in front of the seat belt reel and in 1" from the structure behind the door jamb. Center punch and drill a 3/8" hole. 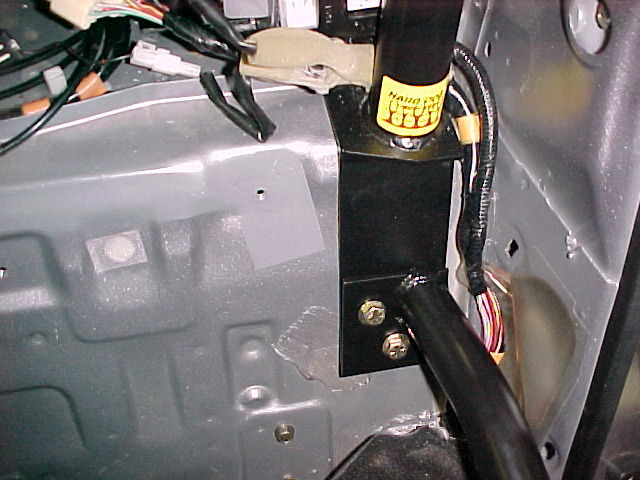 Put a door bar in place by inserting the welded bolt through the hole and check clearances for the seat and door panel. Drill the other mounting holes through the plate when you are happy with the placement and install the rear backup plate with the supplied bolts, washers and nuts. Snug but do not tighten the bolts until all of the bolts are in place. Follow the instructions above for mounting the front plates and torque the nuts to 45 - 50 ft/lbs.